There are only a few Photoshop books that I actually use. Sure, I flip through them for inspiration, but not for actual how-tos. Photoshop User magazine is a much better source. The exception is How to Cheat in Photoshop CS3 by Steve Caplin. Just to see what he can accomplish in Photoshop is worht the price of the book. Just look at Chapter 8 — Liquify: Turning heads! He take a picture of Patrick Stewart looking directly into the camera and manipulates it realistically to look to the side. This book was written for advanced Photoshop users. I was thrilled when I saw his new edition How to Cheat in Photoshop CS4. Unfortunately, he lost the magic! 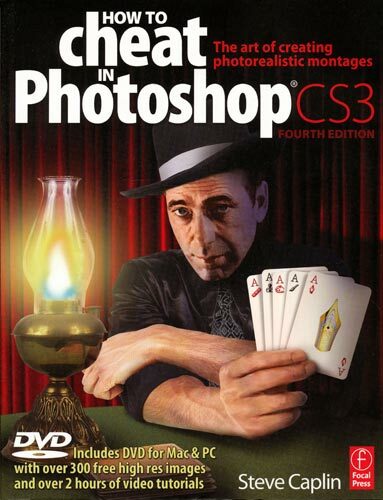 As a result, I recommend that you find the CS3 book while you still can, and skip the CS4 book. In creating the new edition, Steve Caplin dumbed down the book to a beginners-intermediate level. The content is filled with new examples, but they are not up to the high standards set by the previous CS3 book. The material for CS3 is still relevant for users of CS4. Afterall, it is more important to think about what you can accomplish in Photoshop, than the literal step-by-step process.